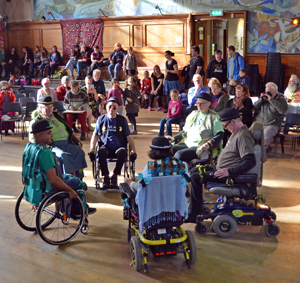 Members of East London Wheelchair Dance Club at the Dance Around the World Festival at Cecil Sharp House on 25 October 2015. Welcome to the Folk in Motion website, the home of 'wolk' dancing! 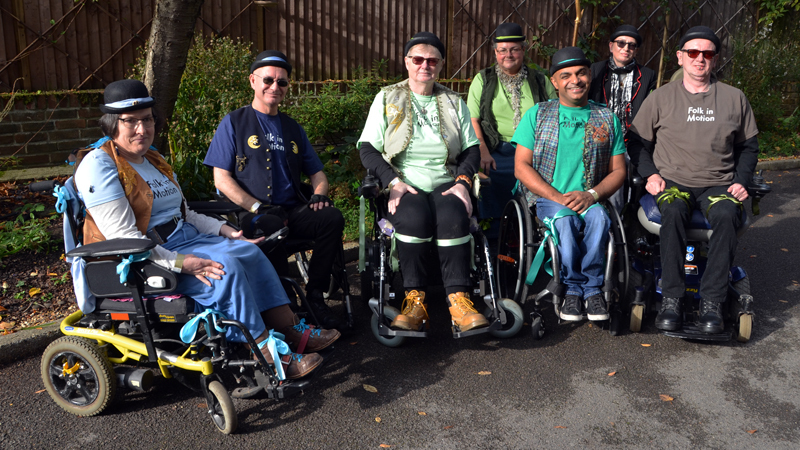 Folk in Motion is a Community Interest Company (no 8609883) that is working to involve wheelchair users in adapted forms of traditional dance and to show the world that dance is for everyone. We have been granted the prestigious London 2012 Inspire mark, the badge of the London 2012 Inspire programme which recognises exceptional and innovative projects inspired by the 2012 Games. We also run the free East London Wheelchair Dance Club, where anyone who is interested can join us to learn wolk. In February 2014 we presented Access All Areas! 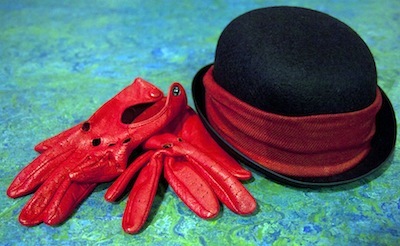 at Cecil Sharp House, the home of English folk dance, to celebrate the installation of step-free access to all floors. As with all forms of dancing, Wolk boils down to people moving their bodies through space in time to music — in this case, by moving their chairs in unison through a series of patterns and shapes. Wolk does not require any physical ability other than the ability to move a wheelchair by hand or with a joystick, and people who need to be pushed are welcome to join in. Like street dance, teams aim to synchronize their movements and to move through the different patterns as precisely as possible. However, Wolk is first and foremost meant to be fun for all concerned; precision is something that can be worked at over time as a long-term goal. Wolk celebrates diversity, and teams are built on cooperation and working together and making allowances for each other rather than on uniformity. 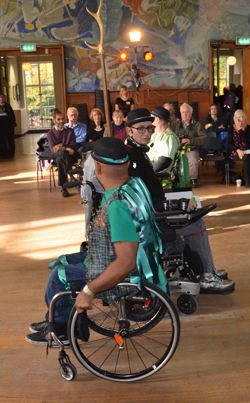 The Folk in Motion demonstration team is available for booking for performances and to lead workshops and participatory wheelchair dance sessions. We also include videos of the dances wherever possible and will continue to add these. Send us links to yours too and we will add these to the site. If you are interested in developing your team and enjoying different forms of wheelchair dancing, we encourage you to join the UK Wheelchair Dance Sport Association where you will be able to learn dance forms as diverse as ballroom and Bollywood as well as developing your dance skills and training to be a teacher.